Introducing Buddha Blends 100% pure, therapeutic grade essential oils from organic and wild-crafted plants and resins. We understand the importance of not only purity, but every aspect of creating the finest, most therapeutically-active essential oil. It is our intent to ensure that you receive these benefits from every essential oil. 100% Certified Pure, Therapeutic Grade Essential Oils- no fillers, additives, bases or carriers added. All oils are either Organic, Wild-Crafted or Ethically Harvested. The natural healing power of the earth's gifts, such as minerals and plant products, can be magnified by "charging". This is done using restructuring codes, crystals and intuitive insight. Each bottle of Buddha Essentials is "charged" for greater potency. These oils are here to assist in the stages of transition where ever you are in your journey. Most bottles are 15 ml (just over a 1/2 ounce) with the exception of the more expensive oils that are in 5 ml bottles. We also have starter kits for your home pharmacy. Each kit includes 6/ 10 ml bottles. We now offer a beautiful natural resin oil-Amber. It comes in 5 ml roll on bottle, a perfect natural perfume. Satsona Soul Essence custom blends available by appointment. Eucalyptus Radiata is a softer version of Eucalyptus Globulus. It has many of the same therapeutic properties of the well- known globulas variety, making it an excellent choice for cold and flu season. It’s an immune stimulant, anti-viral and anti-microbial. It’s an expectorant and antispasmodic making it one of the best essential oils for the respiratory system. Because of its gentle quality, it’s the preferred choice for children and the elderly. This variety is one of the most versatile of the eucalyptus oils. The aroma is clean fresh and expansive and is suitable for topical use, diffusing, and direct inhalation. An excellent way to utilize the oil's supportive properties is to add a few drops to a steaming bowl of water. The heat from the water will vaporize the essential oil, allowing you to inhale the moist, aromatic air to help support your breathing. It may also dry up phlegm and provide relief of sinusitis. Eucalyptus and lemon oils added to a spray bottle of water can be used to disinfect the air in a room- a cold-air nebulizer or adding the oil to a humidifier can do the same. All Eucalyptus oils are excellent insect repellents. They also help treat insect bites and lice. At a deeper level, the essence of eucalyptus is best when one feels constricted by their surroundings. Eucalyptus oil helps disperse the negative feelings associated with past events or feelings and brings “room to breathe”. This oil transforms a sense of suffocation into an expansive renewal. Safety: Eucalyptus can be toxic when taken internally. This lovely oil is distilled from the boughs and berries of the Himalayan juniper tree. This particular juniper grows at an altitude ranging from 8800 to 15,400 feet in the Himalayan region of Nepal. Juniper is an effective detoxifier and blood purifier. It’s beneficial for edema, gout, lymphatic issues and acne. Its diuretic properties make it widely used in weight loss and cellulite blends. Juniper clears and purifies our personal space and our minds. It helps to ease restlessness and is a perfect aid for meditation. It helps to open our inner sight. High altitude French lavender is considered the benchmark among all the varieties of lavender. Essential oils distilled from within the "fine variety" are grown at over 2,400 ft., and at a lower temperature which preserves a fuller and more potent aromatic and therapeutic profile (higher ester content). The result is exquisite oil with a clean, fresh, sweet floral aroma with a slightly herbal undertone. Lavender is the most versatile essential oil and no home should be without it. It has an outstanding balancing and healing effect on the nervous system. Lavender Fine is the most relaxing of all the Lavender essential oils due to its high ester content. It offers a soothing and antispasmodic effect that can assist tight muscles, digestive problems, spasmodic coughs, menstrual cramps, insomnia, and tension headaches (blend with peppermint). Lavender's anti-inflammatory, skin-healing properties will help heal burns, bug bites, wounds, bee stings, rashes, acne, and skin irritations or infections. At a deeper level, lavender is soothing in times of trauma. It’s an aromatic “Rescue Remedy”. It brings balance to the body and the mind. It works wherever there is a need. Lavender encourages full expression and perfection of the individual. It helps calm the nervous anxiety that comes with over sensitivity and shyness. How to Use: Lavender can be blended with any essential oil successfully to enhance the scent of a blend or to enhance the therapeutic properties. Use in baths, diffusers, massage blends, lotions... Imagination is limitless with Lavender. Lemon essential oil is like the captured essence of the sun. It’s refreshing, uplifting and purifying scent brightens any mood. It’s like bringing the sunshine in your home or workplace. It expands energy, promotes a sense of opening and reduces tension and depression. Lemon oil can be very beneficial to the circulatory system and aids with blood flow, reducing blood pressure and helping with nosebleeds. It can help bring down fever; helps relieve throat infections, bronchitis, asthma and flu. Lemon oil soothes and relieves headaches and migraines and is helpful for rheumatism and arthritis. It is also used for clearing acne, cleaning oily skin and hair, as well as removing dead skin cells, easing painful cold sores, mouth ulcers, herpes and insect bites. In the Diffuser: Lemon essential oil is a great oil to have on hand and next to your diffuser year round. Its ability to uplift the mood is almost unparalleled. It can be used for colds, voice loss, flu, depression, stress, lack of energy and fatigue. It furthermore relieves irritation and also helps improve concentration, clears the mind and helps in decision making. It is a cheerful scent with a delicious sweetness. Clarity Blend: In your diffuser mix lemon oil, tea tree and lavender to freshen and purify the air. Direct Palm Inhalation: Inhale lemon mixed with lavender to receive the invigorating effects. Lemon oil can be used in a cream or lotion to clear congested skin. The astringent properties are great for oily skin conditions. The antiseptic effect of lemon oil on the other hand, helps to treat any cuts, boils and minor wounds. The rubefacient action of the oil further helps to reduce cellulite, as well as helping with acne. On a deeper level: lemon is cleansing to the spiritual bodies as well as the liver and kidney, it will release patterning and open the heart center. The result is joy and hopefulness with clear thought. Safety: No contraindications have been identified for both lemon intake and the use of lemon essential oil, although lemon essential oil may cause temporary photosensitivity and its overuse can irritate the skin. Like any other essential oil, it is best to keep lemon essential oil from the reach of children for safety’s sake and to never use it in undiluted form on skin. Rhododendron Leaf essential oil has a complex aromatic profile that has a sweet, fresh, green, resinous, balsamic bouquet with a coniferous undertone. In the Sowa Rigpa (Tibetan medicine traditional), Rhododendron is also known as balu ot sunpati. Rhododendron has calming, grounding, centering and joyful qualities that can be helpful in cases of depression, fear and anxiety. It’s a beautiful oil to use while in the process of loss and bereavement. On a physiological level: it has analgesic, anti-inflammatory, anti-bacterial, anti-fungal, anti-spasmodic, decongestant and immuno-stimulant properties and can be very helpful in reducing nasal mucous production and swelling. Rhododendron is also helpful in cases of Rheumatoid Arthritis. It’s considered to be a liver tonic and can support both the liver and the functioning of the adrenal glands. On a deeper level: Rhododendron assists in the opening of the heart. It assists us in attracting our soul family. This essential oil enhances meditation and assists past life regression. It’s generally considered non-toxic, non-irritating and non-sensitizing. The beautiful Rosa centifolia in full bloom is a delicate pink rose with light roundish leaves. It has a deep, rich rosy-spicy aroma with honey-like notes. Used throughout history for its intoxicating aroma, Rose is the quintessential oil of the heart. It uplifts the mood, calms anxiety, and encourages a feeling of well-being. It’s one of the best essential oils to use in times of sadness and grief. Rose has a tonic, regulating and cleansing effect on the skin and is tonic for the female reproductive system. Safety: Rose De Mai Essential Oil is non-toxic, non-irritant and non-sensitizing. Avoid use in early pregnancy and do not take internally during pregnancy. Rose de Mai Absolute is very concentrated – It’s best to dilute this oil into carrier oil prior to using. Available in a 10% jojoba dilution or a 5 ml undiluted dropper bottle. Wrap yourself in a bouquet of precious petals with this alluring scent. Bulgarian and Moroccan Roses blended with Jasmine, Ylang Ylang, Rose Geranium and a touch of Sandalwood in a base of organic sunflower oil. Native to the islands of Vanuatu and New Caledonia in the South Pacific, Buddha Blends' Vanuatu Sandalwood essential oil comes from one of about 20 species of the genus Santalum. It’s an excellent alternative to the essential oil from the endangered Mysore Sandalwood (Santalum album) in India, for aromatherapy and perfumery purposes. This beautiful oil has a soft, rich, creamy, delicately sweet, woody-balsamic aroma and excellent tenacity. The santalol content of Vanuatu Sandalwood is relatively high compared to other sandalwood oils which accounts for its long-lasting fragrance. Sandalwood’s history dates back thousands of years. It was burned as incense and used in the construction of temples. It’s considered a quintessential ritual, ceremonial, and meditation oil. Its relaxant and sedating properties are used to still the mind, alleviate stress, anxiety, fear and depression while promoting an overall peaceful state. It’s also used as a sexual tonic and an aphrodisiac. Its aroma is thought to support the journey of the deceased to a magnificent afterlife. Therapeutically, sandalwood is emollient, tonic, sedative, and useful in chronic and inflammatory disorders. In the respiratory tract, sandalwood oil is used in vapor therapy for treating chronic bronchial infections and coughs. It’s excellent for dry, dehydrated skin, though it is also mildly astringent and therefore can be used in cases of acne or oily skin. This cooling oil has also been used topically to reduce skin inflammation and infection. 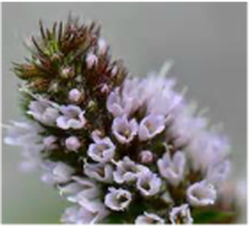 Peppermint Oil is extracted from the flowering plant through steam distillation. This oil is well known for the dramatic effect it has on the body and mind. Peppermint is well known for its benefits for the digestive system. It has been used to help relieve nausea and an upset stomach. It has been shown to help in cases of food poisoning, motion and travel sickness. This oil stimulates the liver and gall bladder to release bile (supporting digestive activity) and also inhibits muscle spasms in the intestines. Peppermint is beneficial for relieving painful muscles and joints. When added to a blend, it is especially beneficial with cooling any “hot” areas. This is due to the chemical constituent of menthol. Menthol produces a sensation of coolness which the body then increases blood flow to the area of application, thus creating a warming effect. It can also be used in small dilutions to cool “hot”, itchy skin issues. Peppermint is a mild expectorant and helps with sinus congestion. This essential oil works wonders for relief of headaches…especially ones that are related to digestive problems. Peppermint sharpens mental focus. As cooling oil, peppermint is also effective for taking the edge off of tension. Peppermint’s cool and clearing nature makes it ideal for stimulating mental agility and improving concentration for the tasks at hand. It is also effective against worry, grief and heaviness. This is a great oil to keep on hand next to your diffuser in your office or work studio. This Geranium (Pelargonium graveolens) has a wonderfully soft, floral scent. Pelargonium graveolens, the rose-scented geranium, belongs to the same plant genus as the popular red-flowered window box geranium. The essential oil in rose geranium leaves has the constituents -- geraniol, linalol and citronellol -- that are also present in rose oil. Geranium is indispensable in aromatherapy. On an emotional level, geranium promotes stability and balance. Its aromatic influence helps release negative memories. It has been used traditionally to support the circulatory and nervous systems, a great deal of its strength lies in its ability to revitalize body tissues. Known as a "woman's oil," geranium seems to have a hormone- balancing effect, and traditionally has been used (blended with clary sage) to alleviate problems associated with menopause and menstruation. It’s one of the best skincare oils, offering relief from congested, oily and dry skin. It is believed to balance sebum making it the oil of choice for combination skin) and to keep the skin smooth and supple. ROOM FRAGRANCE: ideal oil for this purpose as it can create a tranquil atmosphere, but without marked sedation. It is relaxing, but mentally uplifting. The fragrance is persistent and therefore it makes an ideal room deodorant, the fragrance in a bathroom can linger for hours. INHALATION: The vapor inhaled after putting a few drops in hot water, may help nasal and bronchial ailments because of its mild antimicrobial properties. It has an anti-inflammatory action; this can help soothe inflamed mucous membranes. BATHS: Add a few drops of geranium oil with lavender for a deeply relaxing bath experience that benefits skin conditions. Geranium oil blends well with most oils. On a deeper level: Geranium helps us connect to “feeling”-to our emotional sensitivity, our spontaneous nature, and our healthy thirst for enjoyment and pleasure. This allows one the opportunity for more intimate communication, gaining a deeper understanding of one’s self and of others. Safety: Repeated undiluted use on the skin can cause possible sensitization. On a deeper level: It is excellent for the skin, and its aromatic influence helps release negative memories. Used traditionally to support the circulatory and nervous systems, a great deal of its strength lies in its ability to revitalize body tissues. Blood orange has a deep, fresh, radiant citrus aroma that adds a sparkle to any mood. Blood orange has many wonderful properties, especially the effect on the mental and emotional systems. It uplifts and helps to reduce stress with a balancing effect on the nervous system. It’s a perfect choice when feeling down or depressed. The vibrant orange color, red flesh, tangy flavor, and bright scent of this widely used fruit are all synonymous with joy, sunlight and sweetness. Its appealing aroma and ease of blending make it useful under almost any circumstance and a valuable addition to therapeutic blends. On the physical level orange oil, topically applied, can promote circulation, which in turn enhances lymphatic flow, encouraging detoxification. This action has a positive effect on the immune system, assisting in eliminating toxins from the body both during times of wellness as well as cold and flu season. Orange oil, when inhaled, can bring digestive harmony. It’s an excellent skin tonic to support clear skin. It can be used in massage to smooth cellulite. Add several drops to bathwater to help eliminate toxins and cleanse the lymphatic and support the immune system. Add 10 drops orange oil and three drops of peppermint oil to a spray bottle for a revivifying air freshener. Orange helps us be more adaptable and relaxed in times of change. It releases stagnant thoughts and energy and assists in unblocking rigid attitudes. It’s great for hard-working individuals who demand perfection. Let go and enjoy! Safety: Avoid direct sunlight for up to 12 hours if used topically. Buddha Blends Amber Essence Oil has an exotic aroma with sweet and earthy undertones. This special blend is a beautiful, full bodied natural perfume and is a personal favorite. It includes an array of oils held sacred for millennia – Sandalwood, Cedarwood, Frankincense, Myrrh,– and will carry you back to a time when precious oils and resins were as highly valued as gold and gems. This blend may be used to calm the mind, for meditation or a beautiful personal fragrance. Six foundational 10 ml essential oils perfect for home use, gift giving, or travel. Frankincense, Carterii Essential Oil (Boswellia carterii) is also commonly known as Olibanum. This beautiful oil has bright citrus top notes and a resinous/coniferous, slightly spicy, balsamic undertone. This particular carterii has a very smooth finish. It's simply divine. The resin of Boswellia carterii, along with its cousin sacra (see below) , contain high levels of soothing compounds, referred to as boswellic acids. These compounds have been found to enhance overall comfort and ease in our bodies and joints, as well as for the health and beauty of our skin. The essential oil of Boswellia carterii contains more than two hundred molecular compounds, which give it a very complex bouquet. Like all frankincense species, it’s derived from oleo gum resins which function as the protective and defensive support for the tree, and in its essential oil form, passes onto us these same precious properties. How to Use: Topical: Apply 2–4 drops directly to desired area. Dilution not required, except for the most sensitive skin. Use as needed. Boswellia frereana is a very special species of frankincense. Frereana is a species of plant native to northern Somalia where the locals call it "Dhidin" or "Maydi" or the king of all frankincense. This frankincense species grows at a higher elevations than Boswellia carterii . The essential oil of Boswellia frereana contains more than two hundred molecular compounds which gives it a beautifully layered aroma and numerous therapeutic applications. A truly sacred scent, this unique variety of frankincense is derived from oleo gum resins, which function as immune and defense support for the frankincense tree. This quality is inherent in the essential oil form, making it a powerful immune enhancer. Frereana like all frankincense species has been used traditionally and in modern times to speed the body's natural healing response. It has helped with asthma, depression, and ulcers. It has also been used for allergies, bites (insect and snake), anxiety, bronchitis, respiratory infections, diphtheria, skin issues, headaches, hemorrhaging, herpes, high blood pressure, inflammation, stress, tonsillitis, typhoid, and warts. Frankincense encourages the healthy growth and regeneration of skin cells, making it ideal for supporting, nourishing and regenerating dry, wrinkled and aging skin, and for enhancing overall skin health. The intoxicating scent of frankincense frereana promotes calmness and relaxation. Among frankincense's many attributes is its use as a spiritual tool for ritual, prayer and meditation. At a deeper level, frankincense can be used for states of mental agitation and worry, or when the mind is distracted and overwhelmed by too many thoughts. When we feel weighed-down by obligations or over-attachment, frankincense can help us break free. It helps to bring self-reflection and insight to us when the ego is on over-drive. This batch is a new distillation that will become richer and more complex with age. This exceptional Frankincense CO2 is from Somalia. The CO2 extraction process captures a broader spectrum of the classic aromatic profile and offers greater stability to the oil. Frankincense CO2 should age to perfection with its clear, rich, smooth, and outstanding aroma! This Co2 Select extraction of Frankincense frereana resin has a sparkling aroma that is vibrant and rich, with complex resinous, piney, and sweet citrus notes intertwined with a floral back note. It has a high level of incensole and incensyl acetate, known for relieving depression and anxiety. Like all of the frankincense resins, it’s revered for its powerfully uplifting and clarifying effects for the body and mind. It provides immune protection and is protective, purifying, and grounding. This rare, wild grown Hojari frankincense is gathered and distilled in the Sultanate of Oman, a historic region known for producing premium quality frankincense that many believe to be the best in the world. This is the very resin reserved for the Sultan of Oman, and what is believed to be the frankincense presented to the Christ child by the Magi. Royal Hojari is the resin from the youngest trees harvested in the Dhofar desert. Hojari Frankincense can be found along the dry Hajar Mountains. The lack of rainfall in this region, is conducive for producing a resin that not only is considered more fragrant than other frankincense species; it contains a higher level of boswellic acid than carterii and seratta. The aroma is fresh, warm, resinous, and coniferous, with peppery undertones and a top note of orange citrus. It’s fresh, bright aroma supports emotional healing, reflection, and introspection. It’s beneficial during times of anxiety and depression and can be used to cleanse an environment of stale, stagnant air or to clear unwanted energy. At a deeper level: One of the prime applications of frankincense is the use as a spiritual aid in ritual, prayer, and meditation. It has been used in ceremony since time immemorial. A must for all home essential oil kits! Next to lavender, Roman or English chamomile is a favorite because of its many beneficial qualities. Chamomile can safely be used on children, the elderly, and animals. Calming Roman chamomile is distilled from the leaves and golden flowers of the chamomile herb. This beautiful oil has a fresh, fruity, herbaceous fragrance that raises the spirits with its calming effect on the nervous system. It aids in relieving anxiety and is recommended for the treatment of insomnia, stress, nervous tension, PMS and mood swings. Its powerful anti-spasmodic properties help to reduce muscle spasms and digestive pain. Combined with true lavender essential oil, Roman chamomile makes an effective sleep aid. Its natural anti-inflammatory properties make it perfect in the treatment of dry, inflamed and irritated skin conditions. On a deeper level: Chamomile assists in releasing the need for control and allows old resentments to gently release. She gives us a sense of calm and ease by triggering a remembrance of our own true nature. Roman chamomile is precious oil that can be diluted in 10ml of carrier oil. It then can be applied topically, as a compress, in the bath, in massage oil, or rubbed into the belly. Diffuse undiluted Roman chamomile essential oil or apply several drops to the soles of feet to reduce fever and calm frayed nerves. Grapefruit essential oil is a refreshing purifier, renowned for its broad spectrum of uplifting effects on the body and mind. Its bright citrus aroma is effective for easing tension from daily stress. It’s rich in the powerful antioxidant d-limonene, making it nourishing to the skin. This multi-use oil also helps to boost digestion, benefits the immune system, assists in clearing the lymphatic system, relieves muscle stiffness, water retention and bolsters the nervous system. Diffusers: Can be used for hangovers, headaches, over indulgence, mental exhaustion and depression. Blended massage oil or in the bath: Blend in massage oil, or add a few drops to the bath to assist with cellulite, colds and flu, lack of energy, jet lag, muscle fatigue, overweight, headaches, moodiness, mental and physical tiredness. Lotions, creams and washes: Used in a base cream, lotion or as a wash, grapefruit oil can help clear an oily, congested skin, help tissues get rid of cellulite and help rid the body of water retention. Air freshening: Add several drops of grapefruit oil to a tissue and place in your car to rejuvenate and deodorize. It will replace stale air with fresh citrus notes. On a deeper level: Grapefruit oil clears the psychological congestion that results from deep-seated frustration and self-blame. It assists in clearing the heaviness from angry disappointment and allows for greater self-acceptance. It helps to ease our hunger for immediate satisfaction and brings a lightness of Spirit. Safety: Topical application could be photo-sensitizing in direct sunlight. Palo Santo is one of the most important trees used in traditional ethno-botanical medicine. This mystical tree grows on the coast of South America and is related to Frankincense, Myrrh and Copal. Only the heartwood from trees that have died and fallen is used for distilling. Palo Santo has sweet notes of pine, mint and lemon, with subtle resinous wood notes and a distinctive pungency that gives the oil an intriguing complexity. Similar to Sage and Cedar, Palo Santo is energetically cleansing and purifying. Its calming, equalizing and grounding quality make it effective for maintaining emotional balance in times of stress. It has an uplifting effect that benefits in times of low energy and depression. It’s a valuable tool for meditation, enhancing creativity, and for tasks requiring sustained concentration. Palo Santo is considered a cousin to Frankincense due to their similar constituents (primarily Limonene), slightly similar aromas and similar uses. In medicinal aromatherapy the oil can be used as an anxiolytic agent that counteracts panic attacks and anxiety, a respiratory remedy for cough, colds, and asthma, for headaches and migraines, and in massage therapy for muscle and joint pain. Direct Palm Inhalation: Perhaps the easiest way to use Palo Santo oil is through simple direct palm inhalation. Place a drop of oil in the palm of your hand, gently rub the palms together, bring them over your nose and breathe! Diffuser: Palo Santo oil is ideal for your diffuser, and combines well with frankincense, grapefruit, lavender and lemon. Diffuse it in your home to help protect and purify and to help you stay healthy. Tea tree oil is an important addition to your home medicine cabinet and first aid kit due to its fast and effective healing capabilities. It has gained a reputation as a "cure all" because of its powerful anti-fungal, anti-viral, and anti-bacterial properties. It’s one of the most powerful immune stimulant oils, and can be used to fight infections of all kinds. It’s also helpful in clearing the skin; it’s often used in anti- acne remedies, as well as in a diffuser to combat the flu and other viral infections. Melaleuca alternifolia oil is used for wound care and tissue healing, and has long been known as a potent anti-fungal agent. It’s the first suggestion for athlete's foot, nail viruses, and other fungal infections. Tea tree carries the power to reinforce the lungs, heart and nervous system. It’s effective for mental fatigue, lethargy, shallow breathing, heart palpitations and poor circulation. There are a wide variety of tea tree oil uses. Inhaled as steam, tea tree oil is excellent for enhancing sinus and respiratory health especially during cold and flu season. To prepare: Add 1-5 drops of oil in a pot of hot water, cover the head with a towel and steam the face while breathing in the healing aroma. The oil can be applied to the hands for direct palm inhalation or added to a diffuser blend. On a deeper level, tea tree is fortifying to the lungs through its camphoraceous bouquet and spicy, bittersweet undertone. It helps promote a more positive outlook by uplifting the spirit and building confidence. It has become increasingly difficult to find pure Indian sandalwood and muhuhu is considered a sandalwood substitute. This unique oil comes from a tree called muhuqwe in Kenya. It has a soft woody (cedarwood-vetiver) bouquet with an earthy, balsamic, slightly musky undertone that gets better with age. Like Indian sandalwood, it can be used for sacred ceremonies. It assists in building confidence on our path. It helps to counter feelings of depression and give us a deep sense of peace that we are all craving. It’s deeply reflective, grounding and inspiring. On the physical level, it’s documented as having anti-fungal, analgesic, antiseptic, anti-inflammatory, antispasmodic, antibacterial, cicatrizing, cooling, grounding, hypotensive, sedative and warming qualities. On a deeper level: African Sandalwood along with many of the tree oils are here at this time to aid us in the transition from the cycle ending to the one beginning. Because of this shift, we are in a time of rapid change. What once took years may now only take moments to achieve. Uses: for direct palm inhalation, for anointing, in the bath in body oils or in the diffuser. This clarifying blend is formulated to enhance greater focus, memory and mental clarity. Saftey: May cause skin irratation if applied directly to skin. This is best in a diffuser, direct palm inhalation, or an aromatherapy inhaler. This effective blend is a combination of my favorite oils for falling asleep and staying asleep. The result is an undiluted synergy that's soothing and effective. It helps to promotes clearing of the emotional body through deeper dream states. Deep sleep can be gently applied using a few drops undiluted on the neck, chest, and/or under the nose. Do this about a half an hour before going to bed. In the diffuser: Diffuse 10 drops in your diffuser when it’s time to relax and unwind. This oil can be diluted in 1 or 2 oz. spray bottle (about 30 drops per ounce) and sprayed on the pillow before bed. Add a few drops to your bath before retiring. Himalayan Cedarwood helps to relieve anxiety and nervous tension while promoting a restful sleep. Its sedative quality aids in slowing down the breathing pattern, promoting a deep sense of inner peace and relaxation. Spikenard is a well- known sedative from the same botanical family as Valerian. It helps calm nervous afflictions, depression, anxiety, anger, and panic. It sedates abnormal heart palpitations and restlessness. This extremely effective oil helps to keep you asleep and help clear the psyche through deeper dreaming. True Lavender (Lavandula angustifolia) is an effective essential oil to help you fall asleep and stay asleep. Lavender essential oil is predominately made up of alcohols and esters and has several therapeutic properties, but is most commonly associated with relaxation. Vetiver Essential Oil is soothing, calming and grounding. It’s useful for anxiety, anger, exhaustion and coping with fear or insecurity. Ylang Ylang: provides relief from stress and anxiety. This oil sedates or calms nervous afflictions, stress, anger and anxiety, while inducing a relaxed feeling. To be used during cold and flu season or when your resistance is low. This powerful combination of anti-viral oils is your first defense for keeping sickness away. In today’s world, viruses and bacteria are mutating and becoming resistant to conventional drugs. Essential oils have a complex chemistry that viruses and bacteria have a difficult time resisting. You not only have the resisting power of the oils, but the strengthening properties for the immune system. Eucalyptus- well-known and wide ranging benefits, including increased blood flow, fever reducer, traditional remedy for sinusitis, bronchitis, asthma, strep throat, colds and flu, hay fever, catarrh, coughs, sinus headache and tension headaches due to congestion. Ravensara- works effectively against acute cases of the flu, through its anti-viral effects, mood-enhancing and energy boosting properties. Cassia- assists with fevers, chills, colds, flu, low vitality, and supports the digestive system. Rosemary- A strong antiviral oil Rosemary helps to stimulate the immune system and excellent for treating colds and flu. It increases the level of cortisol in the saliva. Cortisol is one of the main stress hormones, hurting the immune system. Direct Palm inhalation- Place 1 or 2 drops into the palm, cup the hands over the nose and breathe. Rub on the soles of the feet. Caution: There are "hot" oils in this blend. If you’re using on the skin, make sure to always blend this with a carrier oil. Do not use topically on children under age 3. When life’s challenging circumstances is in your current reality, and the sense of overwhelm takes precedence, it’s time out for some centering! Calm and Centered essential oil blend combines some of the best essential oils for bringing it all back to center. Himalayan Cedarwood, French Lavender, Red and Yellow Mandarin, Egyptian Geranium, and a beautiful Yang Ylang from Madagascar, transforms the anxiety into a state of balanced contentment. This oil can be diffused, added to a bath, blended in a lotion or oil and applied to the skin. Clear the mind and refresh the spirit with the revitalizing scents of some of earth’s most beloved trees. Black Spruce, Siberian Fir, Silver Fir, Rosewood, Balsam Copaiba, and Cassia make this formula the one to use when feeling overwhelmed, sluggish, scattered, congested, or just want to connect with the wisdom of the trees. It's excellent for the immune system and very pleasant to diffuse at home or the workspace. This effective formula contains a synergy of premium essential oils that are powerful agents in restoring a normal balance to the digestive system, relief to sore muscles and joints and even assists the respiratory system. Use Digest Aid to bring soothing relief in cases of: gas, bloating, upset stomach, belching and heartburn and constipation. The synergy contains: Fresh Ginger, Caraway Seed, Fennel, Sweet Orange and Peppermint. Used in a compress, in the bath, through direct inhalation or used with a diffuser. For direct abdomen application, it’s recommended to dilute Digest Aid blend by approximately 10 drops per half oz. of carrier oil or lotion and apply it to the abdomen, rubbing in a clockwise direction. In the Diffuser: This blend is wonderful in the diffuser as it delivers a soothing, cheerful, heart-warming aromatic effect. The aroma enlivens the appetite for life. Add to massage oil and apply entire body including the joints. Add several drops to bath water to boost strength to the body's vitality in times of sickness or upset. Safety: It's possible that this blend may cause sensitivities; users are recommended to use this blend only in dilution. To be used externally. This beautiful, fragrant synergy assists in setting a loving intention to be present to the inner calling of your heart. When we're present with the deeper wisdom of our heart, we make the right choices in our lives. Rubbed into the heart area, it can be very effective in the release of guilt, frustration, intolerance co-dependence and old hurts. It can be diffused in environments where more compassion is needed. It can be used as a fragrance applied to wrists or the neck. Clear the way for the new, creative, more deeply you. This synergy contains: Red Mandarin, Bergamot, Rosewood, Rose Geranium, Palmarosa, Lavender, Ylang ylang, Rose Absolute. ​Safety: Protect the skin if going into direct sunlight for 12 hours if used topically. This blend adds a sparkle to your environment and energetic body. It’s an excellent formula to lift the doldrums or when feeling cranky or out of sorts. This blend adds illumination to any situation.